Chef Adam Evans of Atlanta’s The Optimist has a new pet: Hector the albino lobster. Though white lobsters do exist, Hector is a different kind of albino: carrot colored and very rare. Only one in 30 million to 50 million lobsters have Hector’s coloring. That’s why Wild Edibles, one of New York City’s specialty seafood purveyors, thought better of shipping the brightly hued lobster off to be cooked alive and devoured with butter. Instead, they offered the crustacean to Evans, who said yes, he would gladly be Hector’s protector. After Evans and a childhood friend constructed a large salt-water aquarium (coincidentally, salt-water aquarium building was a hobby of Evans’s in high school), Hector left the Bronx for Atlanta. Not long after Hector settled in, Evans discovered something about his new pet. Hector is a lady lobster. “We saw egg sacs,” says Evans. “There was no doubt that she was a female. But she’s still Hector.” Since there was no male lobster present to fertilize the eggs, they didn’t develop into a colony of baby lobsters. Instead, Hector ate them—at least they didn’t go to waste. 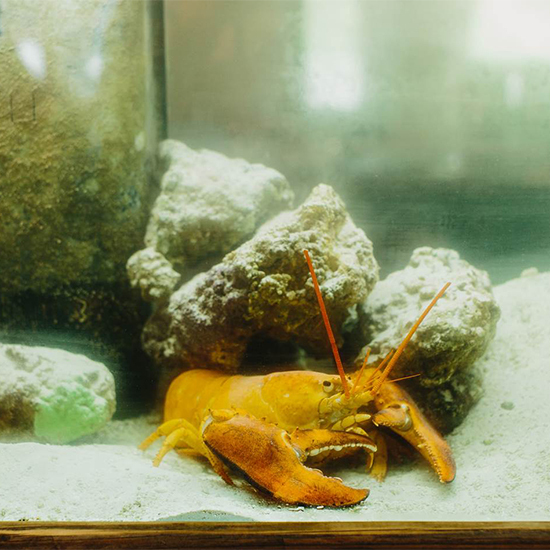 At about two years old, Hector has a lot of living to do: Lobsters are known to live 100 years, and even well beyond. “My great-grandchildren will have to take care of her,” says Evans. But she won’t be bored. Aside from pushing around sand and hiding under the coral in her tank, Hector is The Optimist’s full-time mascot. She’s going to be on shirts, she’s going to help decorate the bar (Evans plans on lacquering and mounting her shell every time she molts) and she’s going to help raise money for organizations and charities like the Edible Schoolyard Project, which played a part in connecting Wild Edibles with Evans. “I would love to bring that program to Atlanta,” he says. All of that is still in the planning stages. For now, Hector just needs to hang out, look pretty and try to ignore the lobster rolls whizzing by her tank.